I LOVE Cauliflower! I have replaced it for my mash potatoes and now for rice! 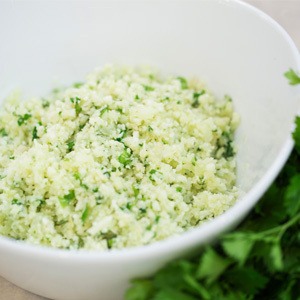 Cauliflower Rice is so versatile, and it is extremely good for you. Did you know that 1 cup of cauliflower can give you up to 86% of your daily Vitamin C? Plus, cauliflower is linked to cancer prevention, particularly in the bladder, breast, colon, prostate and ovaries. Steam the cauliflower and put in a bowl. Using a potato masher, mash the cauliflower down to the consistency of rice. In a large mixing bowl, add all of the Ingredient Mixture. Combine the two bowls and mix. Heat 3-4 Tbsp of coconut oil in a skillet over medium heat. Then, pour the mixture into the skillet. *You only want to use coconut oil when cooking or frying at a high heat. Why? Coconut oil has a high smoke point. Some oils will start smoking at a low temperature and release their nutritional qualities. But, coconut oil retains its flavor and nutritional value at higher cooking temperatures.